Today at the luxury hotel in Alicante Asia Gardens Hotel & Thai Spa we have a reason to celebrate. We have travelled to Japan to commemorate the Aoi Matsuri Festival. Find out what it is about! Aoi Matsuri is one of the three main annual festivals held in Kyoto, the other two being the Festival of the Ages and the Gion Festival. It has been celebrated without interruption since the sixth century; it is considered the most ancient festival in the world. It takes place every May 15 in the two famous Kamo shrines in the north of the city: Shimogamo Shrine and Kamigamo Shrine, which are both recognized as UNESCO World Heritage Sites and also included in the list of Historic Monuments of Ancient Kyoto. Aoi Matsuri Festival´s origin is uncertain, but there were most likely natural disasters that were believed to be caused by the Kamo deities (deities of thunder, storm and rain). After the Emperor made offerings to the deities, the disasters subsided accompanied by a good harvest, and the tradition began. Aoi Matsuri consists mainly of the celebration of different events over two weeks. They take place every year on the same date. The first event is held on May 3 and it is a yabusame demonstration (a type of mounted archery). A few days later, on May 12, a religious procession takes place, where over 100 people dressed up with colouring clothing from the Heian period welcome the god Aramitama to the festival. However, Aoi Matsuri´s main event is held on May 15. This is a one-kilometre-long procession made up of about 500 people, who are dressed up like if they were at a parade of the Imperial Court form the Heian period. They walk from Kyoto Imperial Palace to Shimogamo Shrine. The parade is divided in two parts: the first part is the men´s one and the second one is the women´s. If you would like to enjoy an unforgettable experience for the whole family in paradise, the 5 stars resort Asia Gardens Hotel & Thai Spa is your place. 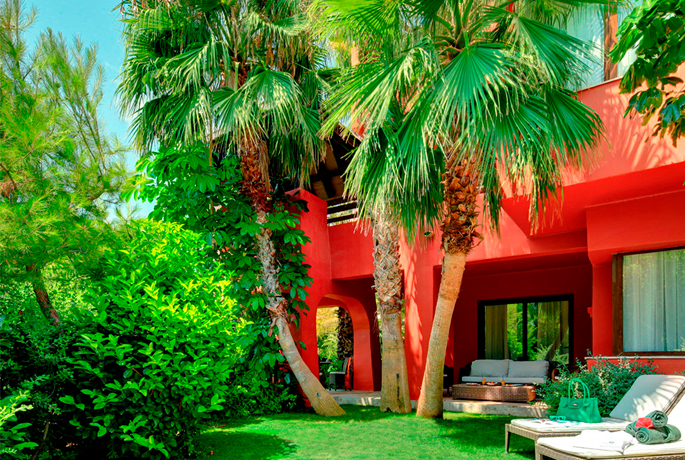 What are you waiting for to Enjoy the exclusiveness of our Suites with views to the gardens?